Let me start with some background so you will know where I come from, what has led me to this, what has programmed my hard drive if you will. I grew up on a farm in southern New Brunswick in the fifties & sixties. I can remember my first day of Grade One. I remember seeing a truckload of brand new 1956 Chevrolet cars going by on the road as I was getting into my Dad’s car for that first ride to school. Ahh yes September of 1955. My parents were good, honest, hard working people who were always working at something. My Dad was up before the crack of dawn to milk his herd of prized Holstein cattle. Mom would have breakfast ready for my brother David, Dad and I by 8:00 a.m. so we could have a ride to school. Some days I would take my bike, some days I would walk. It was not that far, but it was uphill both ways and well, you know the rest. Mom would be occupied for most of the summer/fall seasons preserving jam, jelly, freezing vegetables from our garden and playing the church organ for weekly services, weddings, funerals and any other income producing opportunity that came along. Fall and winter had Mom going to town with Dad on Tuesday evening for choir practice and Sunday for church. She was the organist at one and then the other local mainstream churches for thirty plus years. In the late fifties, my Dad was tiring of the dairy industry, particularly the farming part of it, or the 5:00 a.m. part or, the losing money part, I’m not sure what actually triggered his decision to sell the cattle and become the editor of a farm newspaper. But he did and I’m glad he did. With Dad now employed in the Dairy Center of the Maritimes, it was not long before he was invited to join the local Kiwanis Club. It was, at that time, a group of men who I knew and respected as the pillars of society in the community and our church. The Club met on Thursday evenings in our church hall, was catered by the ladies of the church and the music (piano) was provided by, guess who??? My Mom. After leaving high school and taking a course in Motor Vehicle Repair, I was in a quandary as to my future life. I couldn’t seem to find an opportunity where I was satisfied with the hours, pay check or other people, particularly those in authority. I found myself between positions at Christmas, 1968, when a friend, Robert, invited me to come to Upper Canada for a visit. The opportunity for employment was also available, he said. So Boxing Day, bright and early, Robert and I set off on a trip that determined a lot of my life from that point. My plan was to check it out for a few months and then return home. I returned to my NB home, usually twice a year, for Christmas and summer vacation time. Since I was my Dad’s guest at Kiwanis on several occasions, I appreciated and enjoyed the opportunity to see all the men who I had grown up with and respected. My Dad progressed in the organization, becoming Club President and then Secretary of the Club. As fate would have it, he was the Chairman of the Committee that built the Kiwanis Nursing Home where he passed away in 1992. My Mom continued to provide the music and became the first female member in 1987, when females were finally allowed by Kiwanis International. She continued her membership until she passed away in 2002. Dad’s passing came at a time when my wife Laura and I were planning a move from Toronto. We had a daughter about to enter high school in an area of the city that wasn’t safe anymore. It was no longer “Toronto the Good”. On a friend’s recommendation, we moved to Brantford. Laura commuted to Toronto for several years, while I did for a few months until I found employment locally. Our daughter Isabel attended Assumption College and I believe that was the best decision we ever made with her. Protests about uniform were replaced with enthusiasm for education, drama and art shortly after. Our late arriving son, Owen, went to day care. On the advice of my dear wife, I called the Kiwanis Club of Brantford, to see how I could apply for membership. I did not do any other investigation. I did not check out any of the other service clubs. I didn’t have to, since I knew what a Kiwanian stood for from attending with my father. It didn’t take long before I was asked to join the Board of Directors. When a board member resigned from the Club, I was asked to fill in since I was there anyway. I was put on a few committees as a member and remember enjoying my work with the Key Club group the most. My older brother had been in Key Club and a friend of mine in high school, Frank McKenna was as well. You may recognize Frank’s name. He went on to have a successful law career before spending a few terms as Premier of NB, before becoming Canadian Ambassador to the U.S.
My current project is to help the Kiwanis Club of Paris-Brant become the large, thriving community service group that it is capable of being. We’re what is referred to as a 3-2-1 Club. We have one meeting a month. That is a business meeting that lasts about an hour. We are service oriented and do more servicing than meeting. Satellites are an option with our format, with 6-10 members working at a location away from the main club, but with the full support and cooperation of it. One item on my Kiwanis Bucket List is a Young Professionals’ Club, starting as a satellite, but emphasis on younger members. I once heard the statement “It takes one to make a difference”. I am proud to have been “one” and will continue to do what I can to make a difference in people’s lives. I believe in H.O.P.E (Help Other People Excel) I believe that if you have read this far, we need to find out if you are “ONE”, too. 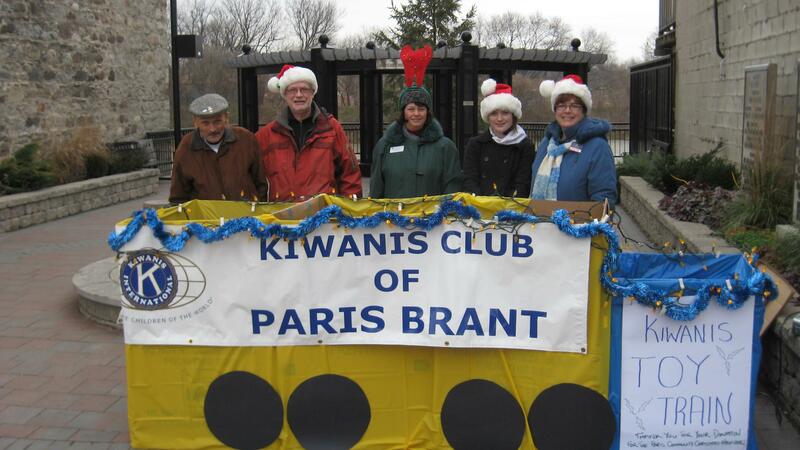 Learn more about the Kiwanis Club of Paris-Brant on their Facebook Page or on their website.